Psychometric Tests - Why are Selection Tests So Widely Used? How Many Personality Traits Are There? Can You Beat the Personality Test? How Can Psychometric Test Examples Help Me? Can I Prepare for Psychometric Tests? Can I Prepare for Aptitude Tests? What is the origin of the Assessment Centre? What is meant by assessment centre behaviors and KSA's? How do I demonstrate my KSAs in an assessment centre exercise? How should I prepare for a promotional assessment centre? These questions show you several (usually 3) views of a 3-dimensional cube with unique symbols or markings on each face and then asks you a question about it. For example, which symbol is on the opposite face? 1) Three views of the same cube are shown above. Which symbol is opposite the X? Some people seem to have a natural talent for imagining objects in 3 dimensions and find these questions straightforward. However, if you’re not one of them and you find thinking in three dimensions difficult, there are other ways to get the answer. In the question above for example, you can simply use a process of elimination. If you can see a symbol on the same illustration as the ‘X’ then it cannot be opposite. The second and third cubes eliminate A, B and C. This leaves only D and ‘other’ as possibilities. D has edges shared with A and B which would be consistent with the third cube illustrated. Therefore D is correct. Although it is not usually specified in the instructions, it is almost always true that in these questions each symbol is used only once. This means that even in cases where elimination is not possible, it is sometimes quite easy to see the solution without mentally manipulating the cube too much. In the example above, you can simply compare the first and third illustrations. The third illustration shows a 90 degree clockwise rotation (looking at the cube from above) of the first illustration. Therefore D must be opposite the ‘X’. These questions show a flat (2-dimensional) pattern which can be folded to make a cube and a number of 3-dimensional cubes (usually 4). The pattern and the cubes have symbols or marking on each face. You need to look at the pattern and decide which of the cubes, if any could be made from it. 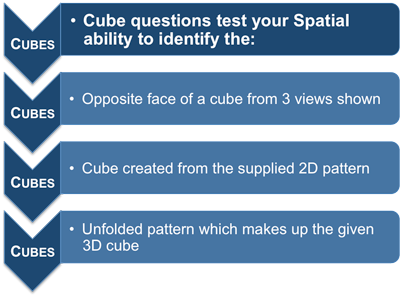 Looking to practice more spatial ability questions? We recommend AssessmentDay. 2) Which of the cubes shown could be made from the pattern? 2) A - The key to these questions is to remember that only three faces of the cube can be shown in the illustration, this means that you need only to consider the relationship between the three visible elements on each cube and see if the same relationship exists in the pattern. This is obviously an arbitrary decision as you could look at a cube from any side. However, thinking of the problem this way makes it much easier to ‘see’ the relationship between the faces of the cube. You can then: look at the front of the cube, find that face on the pattern, use the pattern to identify the ‘top’ and eliminate any options that do not match, use the pattern to identify the other face that touches the ‘front’ (in this example LHS) and eliminate any options that do not match. Another type of question poses the problem the other way around. Here you have a single 3-dimensional cube and a number of 2-dimensional patterns, only one of which when folded, will make the cube. 3) Which of the patterns when folded will make the cube shown? 3) B - The same strategy can be used to solve these questions, remember don’t be intimidated by these problems even if imagining things in 3 dimensions does not come easily to you. The problem can always be reduced to the relationship between three elements, which you can then try to locate in the answer figures. Spatial Ability Tests, Shape Matching, Group Rotation, Combining Shapes, Cube Views, Solids and Patterns and Maps and Plans.